A leaflet featuring various commercial vehicles in 1948. Homepage. This page: Three classic commercial vehicles feature on the cover of this leaflet from 1948. Sixty or so years ago, it would have been the products available from S.R. Ball's timber yard that would have been of main interest with this leaflet, but now it is the classic commercials on the cover that are the stars. S.R. 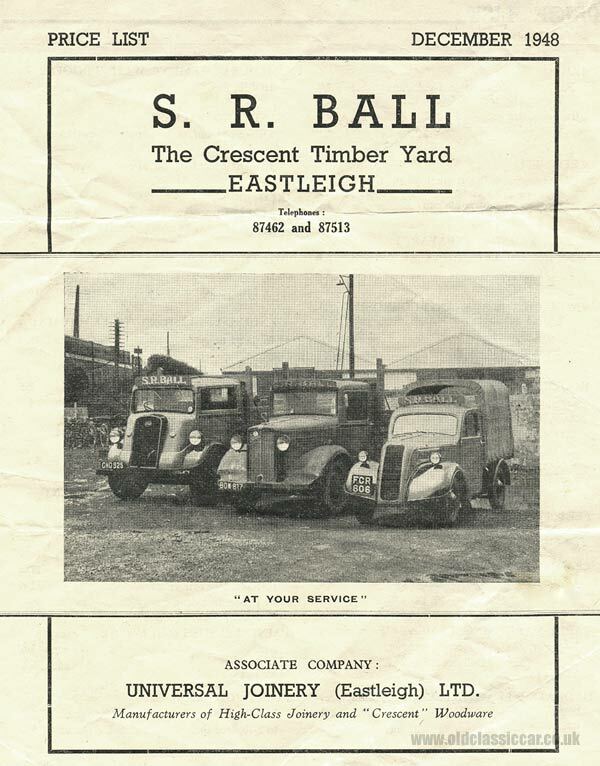 Ball operated from The Crescent Timber Yard in Eastleigh, and could supply not just all manner of timber, mouldings, stakes and weatherboards, but also a wide variety of building supplies. Imagine the joy today of having your DIY products delivered on the back of one of these fine lorries! The Fordson 7V was produced before, during and after WW2. This lorry was registered GHO 295, a Hampshire series used from February 1948. I did wonder if it was actually CHO 295, but that would have made this truck a pre-war version, and the badging to me looks like that used on the post-war Fordson lorries. The signwriting on the headboard also looks a lot fresher than that on the vehicles alongside. Just visible in the background is a horse-drawn cart, perhaps something that Ball's used prior to buying their lorries? A period photo of a very tired Fordson 7V flatbed can be seen on this page of the site's vintage gallery. In the centre, we have a late 1930s (June 1938 onwards) Bedford lorry, registration BOW 817. Identifying the model is tricky, most likely either a WH- or WL- series. Last of this trio is another Dagenham beauty, in the shape of a 5cwt Fordson E04C. This post-war light commercial was basically a lightly-modified version of the pre-war 7Y "Eight" 5cwt range. The earlier vans and coachbuilt variants can be identified by their beadless front wings, larger headlamps and lack of scuttle vents. The wing edge beading, and small headlamps, can be clearly seen on the Fordson shown above, confirming that it is indeed a Fordson E04C of 1946 - 1948. The registration number FCR 606 further pins down the age of this vehicle to post-November 1947. It is fitted with a flatbed rear body, to which a tall canvas tilt has been installed. Within this leaflet, prices are given for a large range of DIY products, many of which you'd struggle to buy today. Need some "Genuine English White Lead Paint"? not a problem, S.R. Ball could supply it in quart tins for just 15/- a time. Proper Creosote, available in either 1 gal, 4 gal or 5 gal tins was available at 2/- per gallon. If you were tempted to build your own garage, or car port, then 8ft x 4ft Asbestos Cement Sheets would cost you 15/- a time, alternatively you could instead have opted for Asbestos Wood Sheets, which would cost 20/- for the same sized sheet. Handily the latter could, we're advised, be cut and planed with the usual woodworking tools - not something that would be recommended today I suspect. Corrugated Asbestos Wood Sheets were also on sale, handy for doing the roof of your new motor-house. More old leaflets and invoices can be found in this Motoring Collectables section of the site. Some are directly related to motoring businesses, whereas others, like this old statement for a window cleaning business, simply feature old cars or commercial vehicles in their ilustrations.